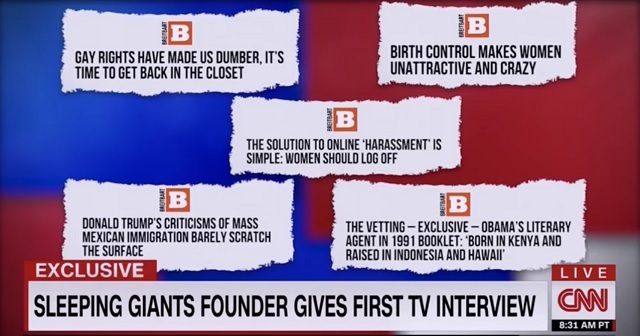 CNN has set their sights on Breitbart after successfully getting Infowars banned and deplatformed from nearly all social media last month. 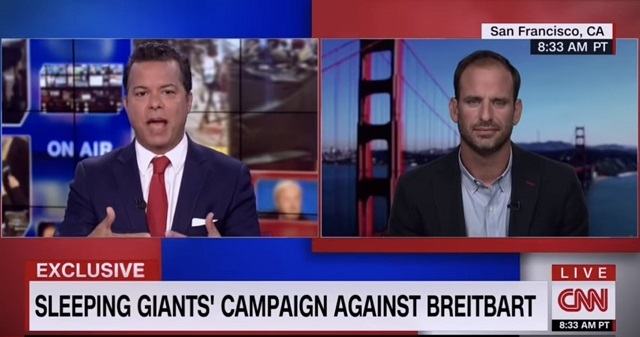 CNN host John Avlon Sunday on "Reliable Sources" suggested Breitbart was "hate news" and conducted a glowing interview with Sleeping Giants founder Matt Rivitz who has allegedly managed to get 4,000 advertisers to pull their ads from Breitbart's website. Avlon said that a "key thing folks might not understand is that there's a profit motive to hyper-partisan news and even fake news and hate news, which is the programmatic ad dollars that flow through that the advertisers don't know they're actually floating these sites in effect." "And so that's where I think you in a decentralized way, centralized in the beginning, started calling this out which is fascinating," Avlon said. "Say, over 4,000 have taken down their ads," Avlon said, "how many have you had to alert again that their ads are back up and who specifically said no we're good with that we want to stay where we are we we knew it or are happy with it?" "There really haven't been that many of those, I can count them on one hand," Rivitz said. "You have awakened a sleeping giant," Avlon said gushingly. CNN has likely been the number one benefactor of Big Tech's mass censorship of right-wing and independent news sources as Google, YouTube and Facebook have rigged their algorithms to help artificially inflate their reach. Of course, that's not good enough for them as people believing their fake news is entirely dependent on silencing those who would call out their bull----, that's why they're actively lobbying Big Tech to censor all their competitors. Just last month, CNN opinion contributor Rafia Zakaria said the banning of Alex Jones and Infowars was the first step towards criminalizing "hate speech" as "a form of terrorism." Zakaria said the decision to ban Alex Jones was "a step forward in recognizing that hate outlets, such as InfoWars, are complicit in domestic terror." While these fake news propagandists love to act like President Trump is threatening the free press, CNN, Big Tech and the rest of establishment media who back these Stalinist purges are the greatest threat to the free press America has ever known.